Grand Valley State University’s Public Relations Student Society of America (GVPRSSA) has recently won four awards for their outstanding impacts in the community. The club strives to help organizations and individuals establish mutually beneficial relationships with the public. As a result of its members' hard work and success, the club earned the Pacesetter award in November and December of 2018 and January and February of 2019. The Pacesetter award is given by the Public Relations Student Society of America to chapters based on their success in areas of membership, national participation and chapter development. Coming soon to downtown Grand Rapids, Mich., will be famous award winning barbeque restaurant “City Barbeque.” City Barbeque is growing fast due to their cozy backyard atmosphere, homemade savory foods and caring staff that gives back to the community through fundraisers. Currently, City Barbeque is popular in eight different states and this will be the first ever Michigan location to open. The restaurant was established in Arlington, OH, in 1999 and will be celebrating 20 years of business this year. City Barbeque will soon be located at 3050 28th St. SE in Kentwood. This will be their 43 restaurant to be up and running. GrandPR, Grand Valley State University’s student-run public relations firm, is celebrating its 10th anniversary by giving back to the community that has supported it from the beginning. In honor of 10 successful business years, GrandPR is performing 10 acts of service between January and March. These service acts will be done in preparation for the Timeless Ten event on Friday, March 29. During GrandPR’s Timeless Ten, students, faculty, professionals and alumni will gather together to launch the “Frank Fund” endowment. In addition to honoring the recently retired GVSU professor Frank Blossom, this endowment event will offer scholarships to students whose goal is to grow in their professional development capacity. On Monday, Feb. 11, over 75 Grand Valley State University students, faculty and staff filed into the Padnos Hall of Science for the chili experience of a lifetime. For 15 years, the GVSU Geology Department has held a chili cook-off that brings students and professors together for a relaxed night of food and fun. The chili cook-off was first created by Geology Professor and Chili Coordinator Peter Riemersma. Since its start, the event has not only grown, but become a welcome tradition. With help from Professors Janet Potgeter and Kevin Cole, Riemersa still organizes and runs the event. Grand Valley State University’s Kirkhof College of Nursing (KCON) was recently granted $600,000 to help assist students with the cost of the program. The Helene Fuld Health Trust has a mission to support and promote the health, welfare and education of student nurses, and is the nation’s largest private funder devoted exclusively to nursing students and nursing education. 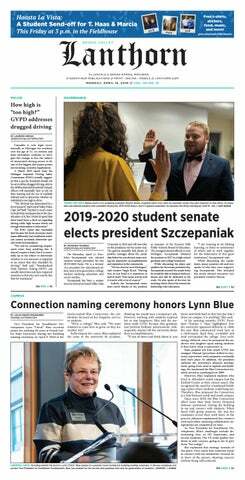 Grand Valley State University student Katarina Samardzija was recently named one of the Newsmakers of the Year by the Grand Rapids Business Journal. She is currently a senior double majoring in marketing and entrepreneurship. The Grand Rapids Business Journal held their annual Newsmakers of the Year event on Friday, Feb. 1 at the Frederik Meijer Garden & Sculpture Park in Grand Rapids. Samardzija won the “Startups” category for her business Locker Lifestyle, which she started about two years ago. She said she could tell she was one of the youngest finalists there by about 20 or 30 years. Friday, Feb. 15 through Sunday, Feb. 17, professional ice climbing athletes from all over the world are flying to Munising, Mich. for the annual Michigan Ice Festival. Grand Valley State University community members will be joining them in a thrilling weekend, inviting students to climb world-class ice on the frozen waterfalls of the Pictured Rocks National Lakeshore. GVSU’s Climbing Center and Hospitality and Tourism Management Department will be taking a group of 15 to 20 students to Ice Fest. These students will experience a weekend of ice climbing, giveaways and meetings with professional mountain climbers. National Eating Disorders Awareness Week is an international awareness affair, and Grand Valley State University is participating with this 19th annual event to promote a healthy body image in its own community. Through a combined effort by Campus Recreation, the Center for Women and Gender Equity, the University Counseling Center and Campus Dining, the Love Your Body Week 2019 will take place Monday, Feb. 18 through Thursday, Feb. 28. The programs this week features aim to educate students about positive body image, the media’s influence on body image, healthy eating habits and more. Some of the events include free group exercise classes, cooking demonstrations, Body Positivity Bash and eating disorder screenings.